Twenty years ago we got caught out in a big storm. We’d set out from Argentina on a zephyr of a breeze, bound for the Falkland Islands. A couple of days later the wind began to fill in – and it kept on filling in until the seas were the size of small mountains. Each mountainous wave, towering above our mast, was capped by a snowy peak several times the size of the boat; and wherever the mountains tumbled over, in an avalanche of foam, the place where they fell seemed temporarily stunned and stilled by the blow. It was only a matter of time before one of the mountains happened to crash down, not upon the vacant sea but upon us – and when it did it rolled our little boat, felling both the main-mast and the mizzen and removing most of the hatches. The rest, as they say, is history. (But if you don’t know about it, you can read the book!). 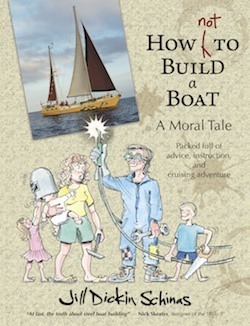 Fast forward to the present era – with our kids now full-grown and our home a bigger, stronger one – and once again we were fooling around in the Southern Ocean. This time we were sailing from Puerto Deseado with the intention of passing through the Le Maire Strait and entering the Beagle Channel. And, lo and behold, a storm arose… But this time we weren’t there to suffer its spite. This time we were snugly tucked up in Puerto Hoppner, in Staten Island. Twenty years ago, if you wanted to sail in the Southern Ocean you took your chances. Now, if you want to sail down there you get the weather forecast; and every day that you’re out there, on the ocean, you get it again. It’s as simple as that. Twenty years ago, we had no way of knowing that a storm was on its way, whereas now we can see them coming and can dive for cover. This article, long requested by various correspondents, answers the question of precisely how to get hold of that vital information which can quite literally save your life. There are two ways of keeping in touch with the steaming cauldron of civilisation while living on its outer rim: One can communicate either by the use of Short Wave radio or via satellites orbiting the earth in space. In the past those who used Short Wave radio were known as ‘hams’ – which is somehow short for amateur radio operator. A sub-species of Homo sapiens, the ‘hammies’ used to enjoy nattering to complete strangers on the far side of the planet, their common ground and main topic of conversation being “the propagation”. In certain atmospheric conditions Short Wave radio signals can be bounced right around the world. By the use of a radio antenna, installed like an ovipositor on the back of the boat, the hamming yotty could capture forecasts sent out at predetermined times by stations whose information covered the area where he was cruising. One famous example of this was Herb Hilgenberg’s forecast for yotties crossing from the Caribbean to the Azores. With their SSB radios the ‘hammies’ could even report their position to this guru and he would shepherd each one safely around the lows. So much for history. Nowadays, although such weather-routing nets do still exist, most folks owning a Short Wave radio prefer to get their forecast via the internet. The advantage of the SSB system is that it is relatively cheap to use. Connection to the internet is not made directly; instead, the user sends an e-mail to one or other of two shorebased networks, and the intermediary then passes the message on and collects and transmits the reply. These two providers are called Winlink and SailMail. Winlink is operated by volunteer hammies and is a free service. SailMail is a cooperative venture and members pay $275 US per year for the right to use it. Because he can’t connect directly to the internet, the SSB user he can only send e-mails – but this is of small relevance to most of us. The chief disadvantage of the system is that the kit is horrendously expensive. You need an SSB radio, an aerial five metres long, a tuner (which fine tunes the length of the aerial in use), and – in order to send messages to the world-wide-web – you need a thing called a pactor modem. We calculated that the entire bundle would cost us at least $5,000 US. For yotties planning to travel to the Uttermost End of the Earth, there are two further disadvantages: Firstly, there are no Winlink operators in South America, so SailMail is your only option. Secondly – and more importantly – this system still relies on the propagation of the Short Wave radio signal, and it relies on your ability to get the signal out into the atmosphere. 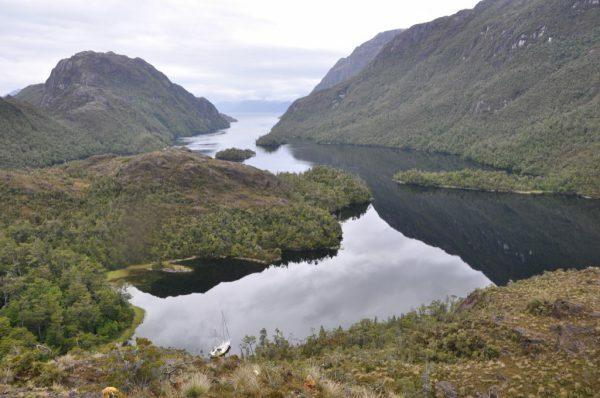 And managing this from the high-walled coves in Patagonia is notoriously difficult. 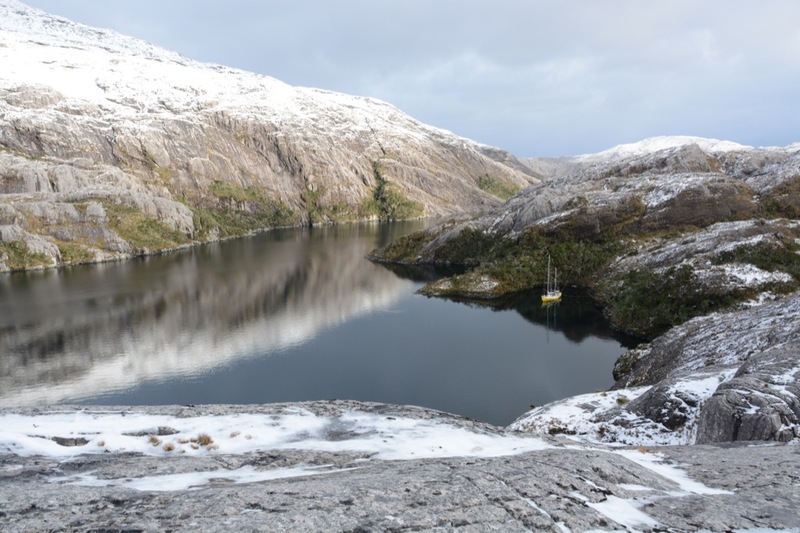 When you’re buried at the bottom of a fiord, the transmission and reception of radio signals is somewhat impaired. Besides making it hard to get a forecast, the inability to connect with the wide world can lead to some interesting events. According to the rule of law, vessels travelling in Chilean waters are required to report their position every day. Now, in practice the authorities are pretty relaxed about this. Many yachts are only equipped with VHF, and since there are fewer than half a dozen shore-stations in the entire network of channels these travellers can generally only report their position via an intermediary. No intermediary – no passing ship or fishing boat – means no message; and the Armada people know this and they accept it. As I say, they’re actually quite laid back – until it comes to ETAs. Overdue ETAs are outside the authorities’ comprehension. 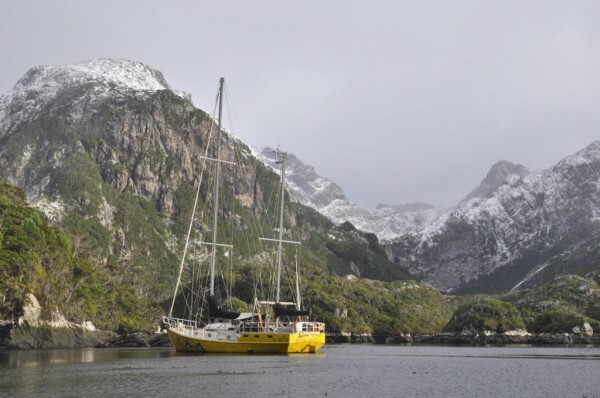 Now – some French friends travelling from Puerto Williams to Puerto Natales fell two days behind with their published schedule, and so they wanted to let the authorities know that they would be later than the ETA indicated on their cruising permit. But they couldn’t. They couldn’t get their radio to connect to the SailMail server. Within just half a day of their ETA having been and gone and our friends not having been and gone – (which is to say, not having gone to the Armada office and reported themselves safe and sound) – the navy leapt into action. They dispatched a search and rescue chopper. In the event all was well – no fine was issued – but this is not the sort of thing that the wilderness cruiser seeks. The amateur nature of the SSB system appeals, and we would use it as a matter of principle were it not for the fact that the rival, commercial method is both cheaper, in terms of the initial cost, and very much superior. To communicate via the satellites one needs a mobile phone the size of a hand-held VHF – and that’s it. 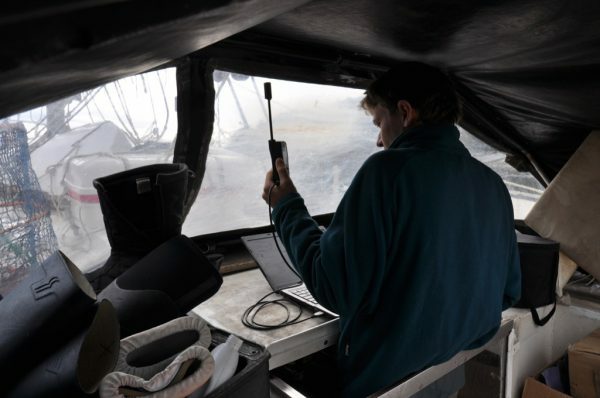 There are actually two sorts of satellite phone with world-wide coverage, the one marketed under the name Iridium and the other known as Inmarsat. There are also various ‘lesser’ devices – by which I mean that there are other companies whose kit won’t help you if you are cruising the high latitudes or if you’re out in the middle of an ocean. They’re not relevant to us, and so they are not discussed here. There are also things, such as Spot and Delorme, which will report the user’s position on a regular basis but which don’t offer the opportunity to download a weather forecast. So far as we are concerned, this is both too much and not enough. We’re very much averse to the idea of transmitting our position to the world on a regular basis, not least because – as we have seen – when things go just slightly awry the world tends to assume the worst. Hence, the only yotty we know who uses this type of service caused his wife a lot of heartache when the device, unbeknownst to him, failed to transmit for two days. Had the woman been of a more nervous disposition then he, too, might have been the subject a visit from the Chilean navy. No, we don’t want any automated systems. And what we want, more than anything, is that life-saving weather forecast! We don’t particularly want for Nanny to know where we are at all times – but we do want to know whether there’s any wind outside. So – the choice is between Inmarsat and Iridium. In the event it’s an easy choice, because Inmarsat don’t really make anything which is suited to the likes of impecunious yachtsmen travelling on a small boat. The Inmarsat system uses three geo-stationary satellites situated 26,000 miles aloft, above the equator. In order to make contact with these satellites you need a powerful aerial which can be turned directly to face them, and the aerial is housed in a dome. So, this is the kit that you see aboard Abromovich’s mega-yachts or on a cruise ship. More recently Inmarsat have come up with a hand-held phone, but you still need to point its aerial at the satellite – so it’s not something that’s going to work very well when you’re at the bottom of a deep fiord – and the system doesn’t work at all in the Arctic circles, because from down there you can’t see the satellites at all. Seemingly, Inmarsat hadn’t anticipated the blossoming of a tourist industry to glimpse the last phase of the ice age. So, step up Iridium – the only contestant to cross the line. The Iridium system uses 66 satellites which are in polar orbit. Picture them, if you will, whizzing round and round the planet – some heading clockwise, as it were, and some anticlockwise (although you’d think that might make them more likely to bump into each other, wouldn’t you?) – and all cunningly dispersed so as to form, effectively, a net. Wherever you are in the world Iridium has you covered. 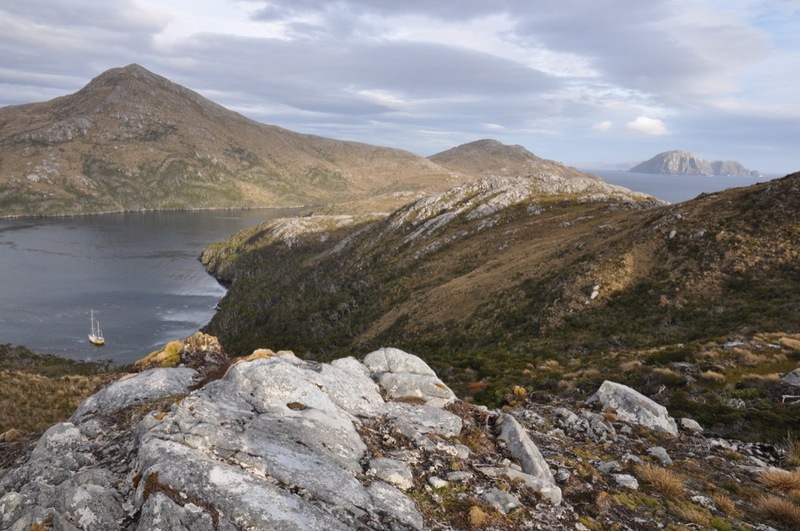 If there weren’t any mountains in the way we’d have two or three in sight at any one time, and even when we’re down in the deepest, narrowest fiord we can always get in touch with the outside world. Impressive, hey? Iridium used to belong to Motorola. It was Motorola who paid Russian and Chinese companies to put those satellites up there in the sky (beginning in 1997); but before the job was done they went bankrupt, and so they sold the whole lot – for a fraction of the cost, we are told – to Google. Sorry! Only kidding! Not to Google – not this time – but they sold it anyway, retaining only the phone manufacturing side of the business. Iridium Inc don’t deal with ordinary folks like us, and nor do Motorola. Instead they employ middle-men. So, you buy your phone from a reseller, as these folks are nowadays called, and you also buy your airtime from a business which has bought a whole chunk of it. The iridium phone costs about $1,000 US. Now, that’s a lot of money – but it’s a lot less than the $5,000 for the SSB set-up. If all you want to do is make phone calls then this is all that you need. With a sat phone and a Pay-As-You-Go (pre-paid) SIM card, or with a contract and the SIM, you can telephone anyone, anywhere in the world. But if you want to be able to connect to the internet and download weather forecasts or report your position then you really need two other things: You need a Compression Service, and you need a Firewall. The problem with satellite phone air-time is that it’s ruddy expensive. When you consider that it cost Motorola two billion dollars to build the satellites and a further 420 million to put them in orbit, this becomes less surprising. Oh, and lest you think that they surely must have paid for them by now, we hear that they’re now busy replacing the whole lot. So, it’s an expensive game. The exact cost depends who you buy from and what kind of package you choose, but ours (which is the cheapest small-scale scheme) costs £400 for 300 minutes and is valid for a year. Any remaining minutes expire at the end of the year. People running businesses from their boats need more time, and they generally elect to pay by the byte rather than the minute – but either way you’re faced with the same problem. Your aim is always to be connected for as short a time as possible – or to be downloading as little stuff as possible, if you’re paying by data usage – and so you need something which will make the information smaller, and you need something which will block the junk. Meanwhile, the job of the firewall is to stop your computer from doing anything except what it’s supposed to be doing. The last thing you want, while you’re connected to the internet via your sat phone, is to have Windows 10 gaily updating. And that’s a thing that Windows 10 does automatically, by the way; you can’t stop it except with a firewall! The firewall can be another piece of software, or it can take the form of an additional piece of hardware. We have experimented with both systems. Our current compression software is called XGate, but it’s also marketed by GTC under the name of RemoteMail – and under that name it’s significantly cheaper (£170 per year, as opposed to £240). Before we had the RemoteMail software we had something from some people called MailaSail – not to be confused with SailMail, above – but this system was much harder to use and it doesn’t work with Windows 10 or on a Mac or with Linux. The aforementioned MailaSail also make a piece of hardware called a RedBox – which is not to be confused with the RedPort, a device which we will meet in a moment. This RedBox solves some of the issues inherent with that company’s system, but it costs £580. Forget it; you don’t need it. What you need instead is a little white box sold by GTC and called a RedPort Optimizer. The RedPort Optimizer manages the connection of the phone to the internet, and this makes life much, much easier. Before we had this little device we could only connect via one pre-Windows-10 laptop – the one installed with the appropriate drivers – and we had to go through a whole rigmarole of turning on the firewall manually, and then manually connecting, and then, eventually, turning off the firewall again. Click on this; open that; click over there; select that… We had to have the whole song and dance written down in a notebook, it was so complicated – and it still took several fraught minutes to connect and get the forecast. Now, with the RedPort Optimizer, we can instantly connect any computer or tablet. You just plug the little white box into the phone, plug the computer into the other side of the box (or connect via wifi) and you’re away. This optimiser costs only £150 from GTC. This, plus a laptop or a tablet, is all that you need in order to be able to get on-line from absolutely anywhere in the world. One last word of warning before I sign off: If you’re buying a sat phone and you decide to have a contract rather than paying for your time or data in advance, be sure that you have an effective firewall (such as the RedPort), and be very sure that you’re using it properly. Some friends running a business from their boat and paying for their satellite phone service by direct debit, recently bought a new firewall gizmo. When the Mate found herself unable to connect to the internet she pressed a factory reset button on the side of this device; and on the following day she received word of the fact that her bank account was overdrawn. She had just benefited Iridium to the tune of $8,000US. This sailor had been on-line for just seven minutes – just long enough to send two e-mails, report the yacht’s position to the authorities, and download the weather forecast – but it appears that the pressing of that button turned off the firewall, and that evidently allowed Windows 10 to do its thing. A Windows update may be several hundred megabytes, and at $13 per megabyte, that soon adds up! You can cruise a long way on 8,000 dollars… Indeed, you can do quite a bit with £400 and we’d rather not be paying it out every year – but, then again, in return for our investment we get safety. £400, plus £150 for the compression service, could buy three or four lifejackets; or it could buy half an EPIRB or a quarter of a liferaft. We have all of those things, but we’re hoping never to have to use them; and the sat phone, by enabling us to get hold of a reliable forecast, is the means by which we avoid their use. Looked at that way, it seems to us to be a very cost-effective piece of kit. When we first signed up with GTC we had a problem signing in to our RemoteMail satellite e-mail account, because we’d changed our password. We only became aware of the problem on the morning of the day when we were planning to disappear into the wilderness of the Chilean channels, and when we sent an e-mail to GTC we got an automatic reply telling us that our message would be dealt with within 48 hours. This would necessarily have delayed our departure by up to 48 hours… and so a general gloom settled over the vessel. However, just two hours later we got another e-mail resolving the issue. In a future article we will share our thoughts regarding the various on-line weather forecast services available and will provide step by step instructions on how to get your hands on the information whilst hiding in the most remote corners of the world. 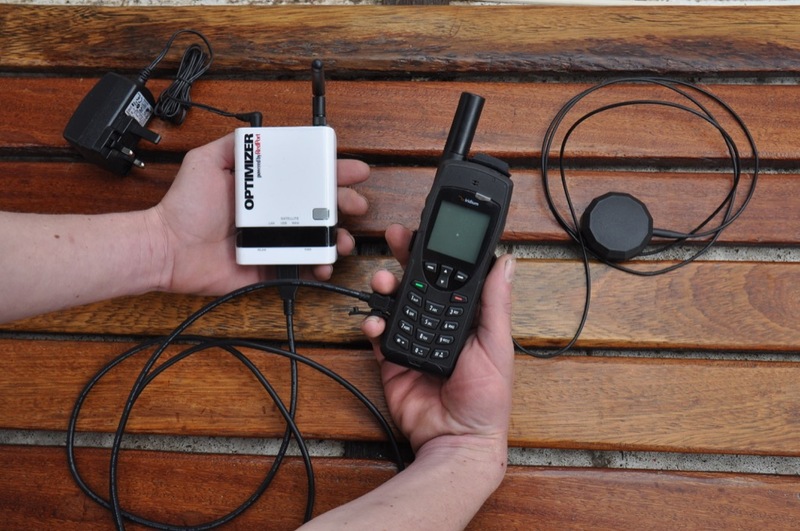 Further to this article – We’ve just been chatting to a guy who uses the new Inmarsat phone in Patagonia. He says that it works “most of the time”. (By contrast, our Iridium phone has never failed to connect.) It sounds as if it’s rather more expensive to use than the Iridium phone since there is a connection charge. If anyone has first hand experience of using Inmarsat in Patagonia and Tierra del Fuego, do please use the comments box and share your experiences with other readers. EDIT : Our sat phone is now playing up, too! We haven’t yet managed to establish whether the fault lies with the device itself or with Iridium’s service. It’s easy to stop Windows 10 from doing updates. Just set up the connection as a ‘metered connection’ and it won’t try to auto update. Also, HF DSC is a part of the GMDSS which sat phone isn’t. Therefore if in dire need a HF DSC mayday may well bring help faster than a sat phone call to Falmouth. I see the two as complimentary not one of the other. Thanks for that, Malcolm. As someone else has pointed out, the sat phone is also good for sending text messages. I have Delorme/Inreach text and satellite tracking for my Jeanneau 50DS sailing sloop which I used with satisfaction on my several offshore trips, including obtaining wx reports (for $1) per report. It’s supposed to work anywhere in the world. would that not be a satisfactory way to stay in touch in remote areas of the southern hemisphere? James, it’s my understanding that you can only get text messages on the Delorme device – is that correct, or are you able to use it to receive GRIB files?